Just weeks after Controversial rapper Noti Flow blasted Singer Avril for her weight, now she thinks that her music is also horrible and sounds like lullaby. Noti who was recently speaking to the standard newspaper, was asked if she would consider working with Avril on a collabo but said that she can't stand Avril's music. Here is how the interview went. 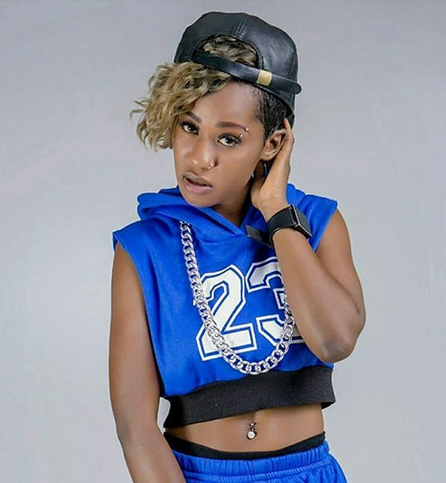 Stand: You recently bestowed yourself the title of the hottest female singer in town and even went ahead to say Avril is no longer hot after which showbiz fans took sides. Are you still feeling the heat? NotiFlow: Like I have said in the past, I like speaking my mind and people should stop thinking that I have beef with Avril. What I actually meant is that she was really hot back then but that is not the case anymore. She has put on weight and I miss the whole hot look. Stand: Given a chance, would you work with her now that you say it’s nothing personal? NotiFlow: On a collabo? No. It is not something I would really consider. She can hardly come out hard like I do. Her songs are more of lullaby and I can’t just stand that. No offence. I’m the Queen of Flow. I’m hot, am I not?